Follow the tips below to get longer life and more comfort from your new bed. The following care instructions can help preserve your warranty and increase the life of your mattress. Mattresses will wear out with regular use, but you can generally get 5 – 10 years out of a good, quality bed. It’s time to replace your bed when your mattress sags or is uncomfortable. 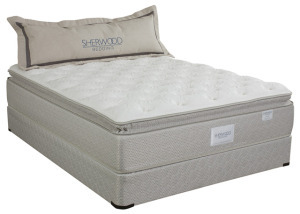 Rotate your new Sherwood Bedding mattress from end-to-end after 2 weeks and then every 2-3 months thereafter. King and Queen mattress must be supported by a strong (preferably steel) frame having a rigid center bar with a supporting leg. Use a quilted or waterproof / breathable mattress pad to avoid stains and protect the mattress finish. Do not remove the tag or label containing the model name. Do not bend, stand or jump on your mattress. Do not use cleaning fluids on your mattress. Please do not smoke in bed or expose the mattress to open flame or fire. Do not lift your mattress by its handles (if applicable). Handles should only be used for positioning the mattress on the frame.